Right on time, just like clockwork. Then this bio-clock thing is reset, and it starts all over again. I can tell when these guys are going to pull the trigger judging from the ebb and flow (yin and yang) of the action, and other subtle hints related to the fighting range (ma-ai), and even body language. If you pay close attention, you'll notice a routine-like pattern that develops during almost every sparring match. Pause. Attack. Pause. Another attack. And so on. Of course, your opponent's timing is intricately related to whatever you're trying to do. So mix up your attack. Being predictable is antithetical to good strategy (heiho). Try to figure out when your opponent's next retreat (yin) is going to happen, and work inside of that (yang). Disrupt and disarm. It's all in the timing. That ticking you talk about is what initially discouraged me from going in Kumite. It's so far from what an encounter would be. Or at least from what I lived as an encounter. 3 minutes? heck, you have the occasion to be left for dead in that time period. Still, the pedagogy of kumite is undeniable. Timing, as you say. Once you get that, the game changes. I have to say that I agree with Mat. I have watch literally hundreds of karate match videos since I started in the martial arts. I would have to say that 90% of them throw all that technique that they were suppossedly learning right out the window and just go straight up Brooklyn Brawler. It irritates me to no end... where is the technique? What message are they trying to send out? The technique is gone, thats where it is. The message is quite clear to me as well: I'm cool because I take karate, but I don't think its very useful. We use called sparring during training and sometimes we just kick the crap out of each other (not during training). I find that when we "play fight" the muscle/nerve memory and the quick thinking of applied technique work a LOT better than just "mooking" around. In all honesty, I really hope that I never have to get into a "street situation" again in my life. I find myself wondering during meditation if I would actually use karate in a fight or if I would concentrate on obtaining victory without conflict. There are so many arguments as to whether or not Karate should be used in a fight with an untrained attacker or not. 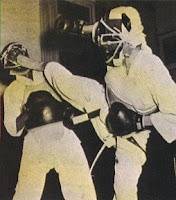 If you read Master Funakoshi's book Karate-do: My Way of Life, he was shamed until the day he died because he used karate against an untrained mugger that he grabbed by the testicles. He says that after the ordeal he realized that the man was an ex-soldier that was so down on his luck that he had to dishonor himself to rob an old man. What an awesome example and what an awesome martial artist. Anyway, those are my two cents. I thank you again John for yet another great, thought provoking post. Keep them coming! Yet another thing to think about while sparring. . . why can't it just come naturally???? I've seen this phenomena in sparring, also. That "pause.. attack.. pause.."
I've actually have had the inner feeling that it would be very "rude" of me to interrupt that pattern on someone. There is a reluctance to disrupt and disarm.. but then, the logical side of me says "duh! That would be the BESTEST thing to do!" I think that experience will help with the whole matter. Point fighting ain't the same as getting mugged, that's for sure! That's the first time I've heard that particular story about Gichin Funakoshi. Along with Morihei Ueshiba (aikido), and Jigaro Kano (judo), Funakoshi was truly a founding father of modern martial arts. Too much thinking during sparring will get in your way. This is true of anything you want to do spontaneously. So we develop strategies ahead of time. That's why training and repetition are so important; the fruit of all that hard work begets "natural" tendencies. The pause/attack phenomenom is very prevalent in sport karate matches. It's the duration of inaction that seems to be unconcious in people. So much fighting strategy focuses on technique. Learning when to strike (or not) can be of great value.